Louvered windows are slatted and adjustable windows often seen in tropical climates, allowing balmy breezes to flow through the horizontal panes. You may have never heard of louvered windows before, but they are fantastic for certain set ups and homes. Discover this close relative of the Jalousie windows. Louvered windows are made up of strips or individual horizontal panes of glass that are attached on the sides to the window frames. The glass can be tilted open by rolling the lever, or handle, and the panes tilt up from their vertical position to allow air through, while still keeping out rain and other external elements. The word ‘louvered’ is actually derived from the word ‘jaloux’, which is a French word that means jealousy. It’s not clear why a term that refers to jealousy was used to indicate a style of window, but who knows? Louvered windows aren’t for everyone or for every type of home or climate. They are most often utilized in mild climates and are a popular option for breezeways, passageways and porches that can benefit from the cooling breezes they provide. 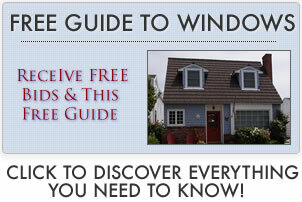 Louvered windows are relatively inexpensive and cost approximately $75 – $100 per window. Installation will increase the price by $100 to $250 and should certainly be factored in determining what replacing your windows will cost. Louvered windows provide natural air conditioning. The open panes allow air to freely flow into a room, cooling it off. This is why they are a popular choice in more tropical climates where air conditioning is too expensive to run or is not available. While air is allowed in, rain and direct sunshine are kept out. Remember though that what goes in also goes out, so they are not a good option in cooler climates where heat loss can rapidly occur. Even if a home is equipped with air conditioning, properly placed louvered windows can create enough air flow to keep rooms cool without needing to run the a/c as much. Cooling breezes through the slats can keep occupants comfy while keeping utility bills down. This is especially true at night and makes for great sleeping conditions when the breezes are blowing. There are no other styles that offer the same look and style of louvered windows. They can add architectural interest and can provide a relaxed and tropical feel to a home. 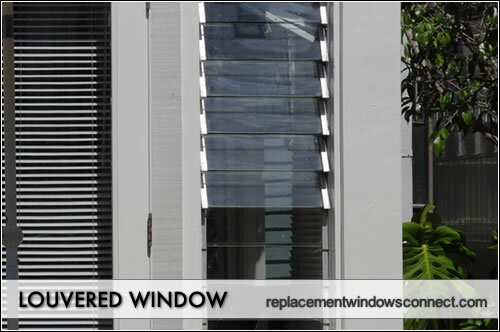 Since replacement window glass would only need to be a single pane (each one is independent of the others), you can easily replace just one or a few panes if broken, without having to replace the entire window. There is no way to completely seal a louvered window tightly due to its construction. Air can leak through the individual panes of glass, even when the window is tightly closed, which makes the windows rather inefficient. While this may not pose a problem in mild or tropical climates where louvered windows are often found, it makes them an impractical choice for those that live in cold weather climates. While louvered windows are designed to keep rain and direct sunlight out, they cannot be completely sealed tightly. This means that if you live in an area prone to severe rain, wind or storms, the windows may be letting in more of the elements than you would like. Since these aren’t completely sealed, it also makes them targets for intruders looking to gain easy entry into a home. The panes can be broken and removed strip by strip without the commotion caused by breaking a large pane of glass. There are lots of moving parts in the panes. This means that they are more likely to suffer the consequences of repeated use and hold up as well as stationary windows. The good news, however, is that individual panes of glass can be replaced if broken without having to replace the whole window.